It’s easy to toss around the word “genius,” especially when it comes to comics. We all have our favorites and we all like to think ours are the great ones. 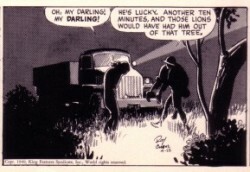 But one look at Roy Crane’s work and anyone can see that he definitely was worthy of the “genius” tag. Crane created two great adventure classics, Wash Tubbs (which later became Captain Easy) and Buz Sawyer, with Wash being called the first true newspaper adventure strip. He’s been dead for 30 plus years, but looking through his strip work, you can see his influence in comics from Milton Caniff to Alex Toth to Howard Chaykin. Even the modern strip, Rip Haywire by Dan Thompson shows a Crane influence as does Randy Reynaldo’s Rob Hanes. And in a classic Comics Journal interview, Art Spiegelman calls Crane an influence on Jack Kirby. Continuing my series on cartooning and cartoonists, Roy Crane wrote about himself and his work back in 1964. This is pulled from an oversized saddle-stitched magazine from Allied Publications with the creatively-challenged title These Top Cartoonists Tell How They Create America’s Favorite Comics. 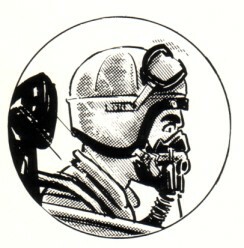 It featured an introduction by Beetle Bailey’s Mort Walker and was compiled by Allen Willette. “I was born in 1901 in Abilene, Texas. I grew up in Sweetwater, Texas. As a result of a three-year drought…which caused the Crane swimming lake to blow away in a cloud of dust…I’ve never since lived beyond the sight and smell of water. My present home is in Orlando, Florida. “I studied art at the Chicago Academy of Fine Arts. In 1918, I got my first professional experience when I became the staff layout man and cartoonist for the Fort Worth Record. In 1921, I worked on the Austin American, and in 1922 I as with the old New York World. 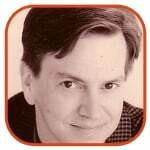 “I always maintained a great interest in cartooning, and at one time I was H.T. Webster’s first assistant. Webster will always be remembered for his Timid Soul panel and other features. “In 1924 I began drawing Wash Tubbs, a pioneer adventure and story strip (it was later to be called Captain Easy). I drew Wash Tubbs until 1943, when I started drawing Buz Sawyer. “It was during World War II, so I decided to make Buz a Navy pilot. It promised lots of action, and I also felt that I would be making a contribution to the war effort. Before actually starting the strip, and to insure authenticity, I did a great deal of research. “I’ve always loved to travel, so I went to many different places in search of information that I could use in the strip; I even spent some time aboard an aircraft carrier. In addition, I gathered together a very large collection of Navy photographs to use as background material. “Rosco Sweeney, who is now featured on the entire Sunday page, was Buz’s wartime buddy. He was also the gunner on the Navy bomber which Buz flew. After the war, I had Sweeney start an orange grove in Florida….the same as I did. I have no plans for bringing Buz into the Sunday page. “Action is one of the most important elements in a strip. In fact, I feel that graphic pictorialization is the essence of the comic strip medium and that is what makes it a unique art form. When newspapers cut the size of the comic strip until there is no room left for anything but dialogue, then that will be the end of comics. “Buz is conceived four weeks in advance. My collaborator, Hank Schlensker, finishes the layouts from my rough drawings. He works approximately one week behind me. I am also assisted by Al Wenzel and Edwin Granberry. I own the rights to the strip. I like that Crane gives a shout out to his assistants. They took over the strip after he retired. I also like that he asserts his ownership of Buz Sawyer. Crane left Wash Tubbs to start Buz Sawyer because the syndicate offered him ownership; the same reason that Milton Caniff left Terry And The Pirates to create Steve Canyon. Even in 1943, you can see just how important it is to creative people to own the rights to their work. Craftint that Crane refers to is a specially-treated paper that creates a series of patterns when certain chemicals are applied. All the “gray” looking shading you see in Buz Sawyer is from the use of Craftint. It’s no longer used since its effects can be easily duplicated in Photoshop. If you want to know more about Crane, check out this essay by Steve Stiles. Over at Potrzebie, Bhob Stewart has a look at a forgotten Roy Crane strip: Frank Battle. If you’d like to try some Roy Crane, I highly recommend Captain Easy, Soldier of Fortune: The Complete Sunday Newspaper Strips Vol. 1 (1933-1935) published by Fantagraphics Books. They have a 10-page pdf you can download that’ll give you a taste of a book you’ll want to get. If you don’t want to order it by mail, I’m sure it’ll be at the Fantagraphics booth at Comic Con International in a few weeks. Volume 2 is coming soon. Not content with just being a great cartoonist, Crane also gave a little back. If you’re attending the University of Texas at Austin (Crane’s alma mater) you can try winning the Roy Crane Award in the Arts that he established back in 1965. Berke Breathed is a prior winner (1980). 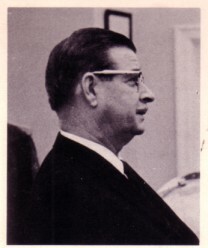 For Comicmix, Michael H. Price provides a transcript of remarks made by Crane back in 1969 during a visit to the Daily News & Globe-Times in Amarillo, Texas. And finally, Daily Ink offers up a run of Buz Sawyer strips from 1943-1945.